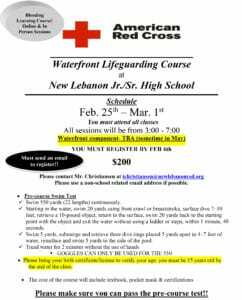 Registration is open for a Waterfront Lifeguarding Course at New Lebanon Jr/Sr High School. Classes will start February 25th through March 1st. Anyone interested must register by February 4th. The cost of the course is $200 which will include textbook, pocket mask and certification. Please contact Mr. Christiansen at tchristiansen@newlebanoncsd.org. Please use a non-school related email address if possible.